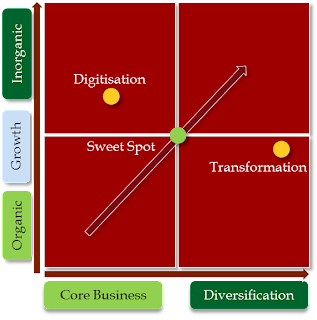 Different organisation require different approach for leveraging benefits from digital transformation in their evolution. Pure Digitisation leads to expansion of core business to digital platforms. Pure Transformation leads to change in traditional business model to a new type of business model. Combination of executing Digitisation (services and platforms) and Business Transformation (transforming culture and business model) in parallel is less agile and is a challenging task to achieve. However this is the best option, executing either option individually or sequentially will not give the desired outcome.